EAGLE BUTTE, SD — It might be the middle of winter, but that doesn’t mean the Cheyenne River Youth Project’s Garden Club is hibernating. To the contrary, the nonprofit organization’s Garden Club starts its winter-spring session at 4:30 p.m. today; open to the 4- to 12-year-olds who attend programming at The Main youth center, this session of Garden Club will run every Monday for eight weeks, concluding on Apr. 2. 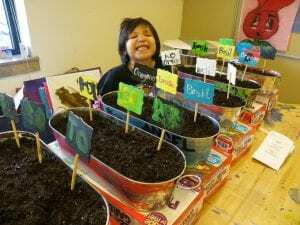 In this session, the children will prepare seed pots and plant bush beans and lettuce. Under the direction of Youth Programs Assistant Floyd Braun, they’ll learn to place grow lights and will be responsible for watering their seeds weekly; on Feb. 25, they’ll assess the seedlings’ growth and feed the fledging plants. They’ll continue monitoring growth in March, trimming and fertilizing the plants as needed. Harvest time is scheduled for Mar. 25, and on Apr. 2, the young students will conclude the winter-spring Garden Club session with a special class that will teach them how to dry lavender.